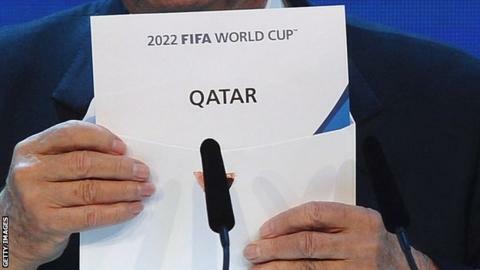 Claims of alleged corruption in Qatar's successful 2022 World Cup bid have been published in the German media. Bild newspaper says it has obtained the "suppressed" 2014 report authored by former Fifa independent ethics investigator Michael Garcia. Bild's report includes details of a $2m (£1.6m) sum allegedly paid to the 10-year-old daughter of a Fifa official. The American lawyer cited a "lack of leadership" as he left football's world governing body, whose executives unanimously agreed to publish a "legally appropriate version" of his report. Bild says it will be publishing the full details of Garcia's 403-page report from Tuesday. The Aspire Academy in Qatar was implicated "in a decisive manner" in "the manipulation of Fifa members who had the right to vote". In a Facebook post, Peter Rossberg - the journalist who claims to have obtained the report - said it "does not provide the proof that the 2018 or 2022 World Cup was bought". He described its findings instead as "like a puzzle that only makes sense when all parts are put together". Fifa's inquiry looked at the conduct of all nine bidding teams who were trying to win the right to stage the 2022 World Cup or the 2018 event, which was awarded to Russia at the same ceremony in 2010.